Braided Jute Rugs | P.C. 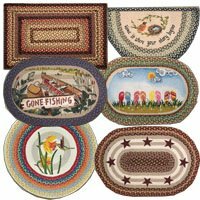 Fallon Co.
Browse our huge selection of beautiful and eco-friendly natural fiber rugs in a tremendous variety of colors, patterns, sizes and shapes. Most are made of 100% jute and sizes range from 20" x 30" to 8ft x 10ft, and shapes including oval, rectangular and heart-shaped. These hand-crafted and timeless rugs complement traditional, contemporary, primitive, coastal, lodge, cabin and country homes. Many designs to choose from including braided styles and some with hand-stenciled motifs. Durable construction and great everyday prices make these rugs a great value. Please note that as with all hand-crafted, artisan-made products, slight variations in color, size, and shape of these rugs will occur and are to be expected. Jute fiber is harvested from the bamboo-like Jute plant. Weaving jute into rugs has been practiced for centuries by the native craftspeople of Bangladesh and India. Jute is a sustainable, eco-friendly product and jute is biodegradable. Many people concerned about environmental chemicals in their home will choose a jute rug as opposed to a rug created with manmade synthetic fibers. When properly cared for, a jute rug will last for many years. Just like other fine rugs, they can be cleaned when necessary with mild soap. Vacuum normally being sure to first trim any loose fibers that might get caught in the vacuum beaters. Do not machine wash.